For Your name is great, and greatly to be praised. As I led the congregation in singing this chorus, I began looking at the faces of the people as they were singing. The auditorium and overflow room were jam-packed with people to the point where it was actually a bit uncomfortable. In fact, there were several people standing up in the overflow room as well as outside on the stairs leading into the auditorium. As I looked from person to person I was suddenly hit with the reality of what was actually happening – There were scores of people, who just a short time ago were slaves to the devil, without hope, and without God, but who were now singing praises to the Lord Jesus Christ with faces filled with joy and peace. The emotional impact was too much, and in order to keep my composure, I forced myself to stop thinking about what I actually saw. God has been so good to the people in our ministries and we give Him all the praise, honor, and glory! I wish you could have the opportunity to know each one of the lives who are being changed by the power of God. This morning we sang a song that our people love so much because of the truth which is contained within it. The devil tests me, he wants me to fail. Though the devil tries to harm me, Jesus Christ is my Victor. To redeem each of us from the power of death. Perhaps a song like this does not mean much to those living in the west. The devil is alive and active in developed countries just like he is alive and active here in Cambodia. He may deceive and blind through different methods, but he is just as real. Here in Cambodia his power is more blatantly obvious. Over the past couple of weeks there have been a number of instances of demonic oppression take place among those to whom we are witnessing. I won’t detail here in this update. Even if I did take the time to describe them to you, the vast majority of you would perhaps be incapable of believing that they took place. There was one testimony in particular of which I took note – it was of Sovan, the father of one of our faithful young men, Veasna. This man has just been saved in the past few months. His testimony was this, “I no longer fear the devil!” One would, of necessity, have to live in a place like Cambodia in order to understand the implications of that statement. For many people here in this country nearly everything they do is in some way influenced by the power of darkness over their lives. The devil has taken note that lives are being changed by the power of the gospel and he has not given them up easily. It is the prayers of God’s people that make the difference between spiritual defeat and victory. It is obvious to me that someone is praying for the lost here in Cambodia who are being dealt with for salvation. There are battles being won! Was that person you? If the eternal destiny of the souls of the Cambodian people were dependent upon the prayers that you have offered up over the past week, how many battles would you guess would have been won here on the front lines? Sunday afternoon Heng was finally able to get out of the bed and he came to my home to return an item that he had borrowed from me. As he returned the item to me he said, “Thank you Pastor, and thank the Lord.” Apparently the Holy Spirit had been working in his heart throughout the night and he had begun to listen. He spoke some words to me briefly in our home that were something along the lines of “God healed me and I have accepted salvation.” I did not really comprehend the implications of his statement and assumed he was simply speaking “religious” talk that he had heard us use many times while witnessing to him. However, perhaps for a short period of time the power of darkness that was oppressing him had been bound, thus allowing him an opportunity to have a clear mind to think about the condition of his life and soul. Perhaps early Sunday morning, in the privacy of his home he had accepted God’s free gift of salvation. Monday morning at around 11:00 a.m. Brother Vannak went to go meet with him and had the opportunity of leading him in the assurance of salvation. 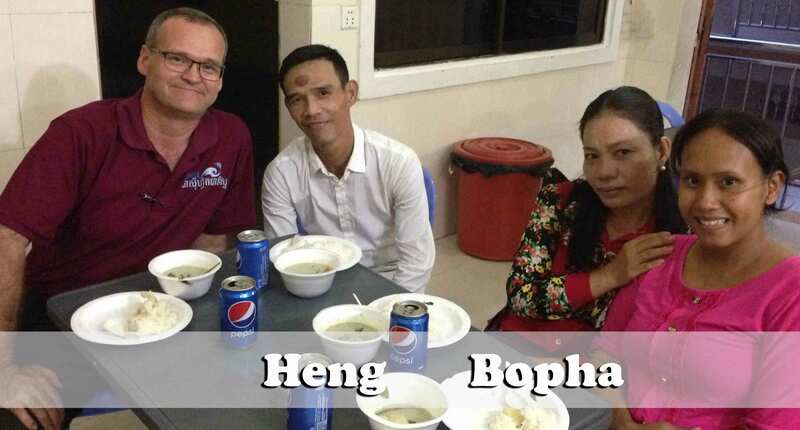 Monday evening Heng and Bopha attended a small fellowship that was held at the church and they could not wait for me to arrive so they could tell me that Heng was truly saved. That was a big blessing to all of us! This is our very first Vietnamese family to accept Christ. 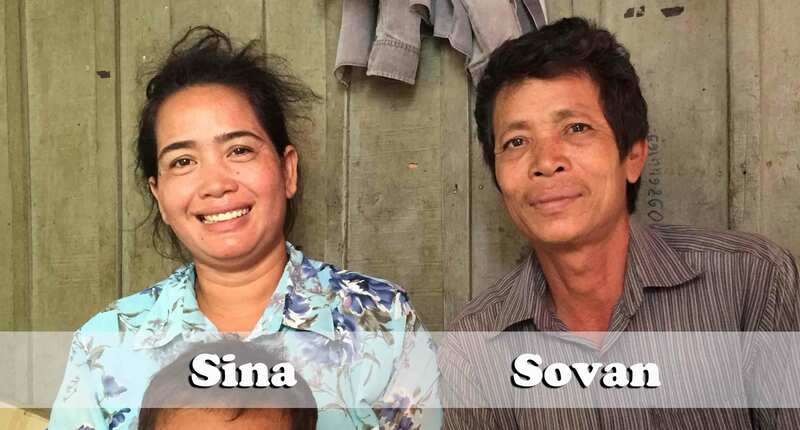 Please pray for Heng and Bopha as we begin to disciple them. I hope and believe that they will be instrumental in being used to see many Vietnamese folks come to Christ here in Cambodia! Bopha has made a profession of faith and we can only take her at her word. We will know her by the fruit of obedience that is produced in her life over the next several months. 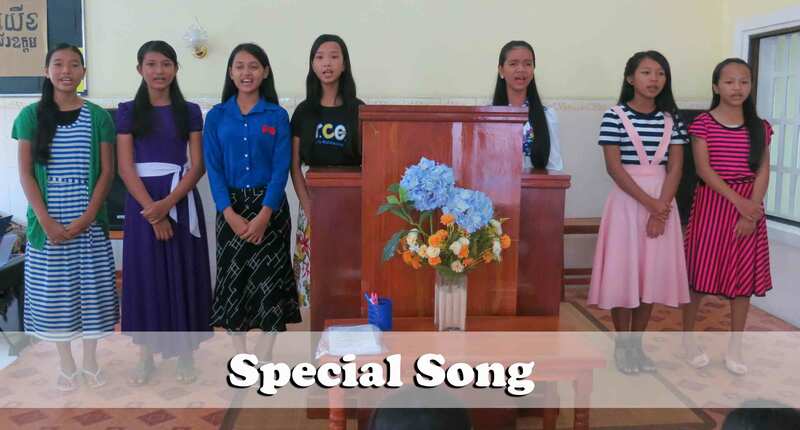 Sunday morning some of the teen girls sang a special medley of several hymns. I know they practiced this song for several weeks with Mrs. Has and they did a wonderful job! Thank the Lord for young people who are willing to serve God with the talents that He has given them. Srey Mohm accepted Christ as her Saviour last Sunday. This Sunday morning she saw Brother Man and his wife, Kanha, in the service. Man used to rent an apartment next to Srey Mohm’s house when he first got married. As Man greeted her and told her that he was glad she was saved and in church, she asked him this question – “When you lived next to me, why did you never tell me how to be saved?” Wow! Man was shocked and embarrassed by her question. He said, “I was intimidated of you. Your house is big (meaning – you are rich and I am not) and I was too scared to talk to you.” She responded by saying, “I have spent many years searching for the truth. I’ve spent a lot of money on false religions. All I ever wanted was to know God but I didn’t know where to find Him.” They fellowshiped and laughed together and Man apologized for not being bold enough to approach her in the past. (Man is the one who relayed this story to me and gave me permission to share it with you.) How many times have we all been guilty of not speaking to someone about the Lord because we wrongly assume that they would reject the gospel? Thank God that He is good and His mercies are everlasting. He is the One Who pursues the lost in order for them to be saved but He always uses His Word and another believer to tell the lost how to be saved. May we be reminded that we need to be alert to the spiritual needs of those around us and bold enough to speak a word when God opens the door. 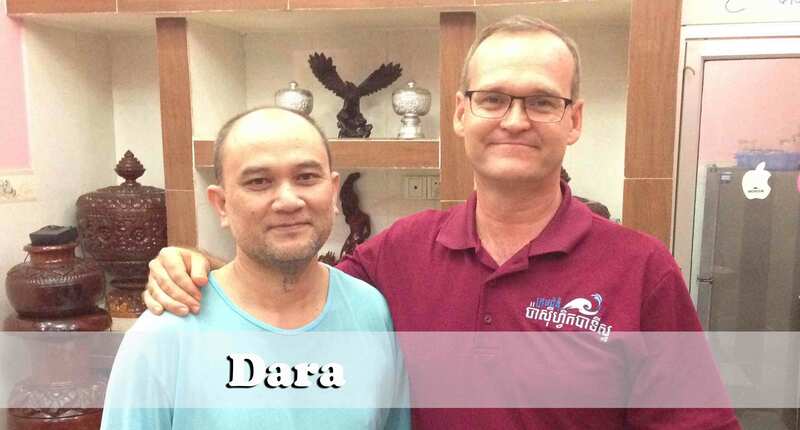 Brother Bounna and I have had an appointment to meet with Srey Mohm’s husband, Dara, today at 2:00 p.m. to explain the gospel to him. After some discussion we posed to him the question, “Are you ready to believe upon Jesus to save you?” He answered that God had been working in his heart for the past 4 years and that he was ready to be saved. It was special to hear him pray to receive the Lord. Thank the Lord for faithful soul-winners who have been planting the seed of the gospel of a long time! Dara is a professor at a university here in Phnom Penh and has the potential to have great influence for the Lord as he grows in his new faith. Please pray that Dara and Srey Mohm will be obedient to grow! Likewise, please pray for their eldest son, Tan Lay Hout (21 years old), to be saved. Sunday morning Sron shared a testimony during the service from 2 Corinthians 1:3-4 which says, “Blessed be God, even the Father of our Lord Jesus Christ, the Father of mercies, and the God of all comfort. Who comforteth us in all our tribulation, that we may be able to comfort them which are in any trouble, by the comfort wherewith we ourselves are comforted of God.” He reminded us that we are saved, not just that we might escape Hell, but in order to live for the Lord. He reminded us to open our eyes and look for opportunities to help those around us. 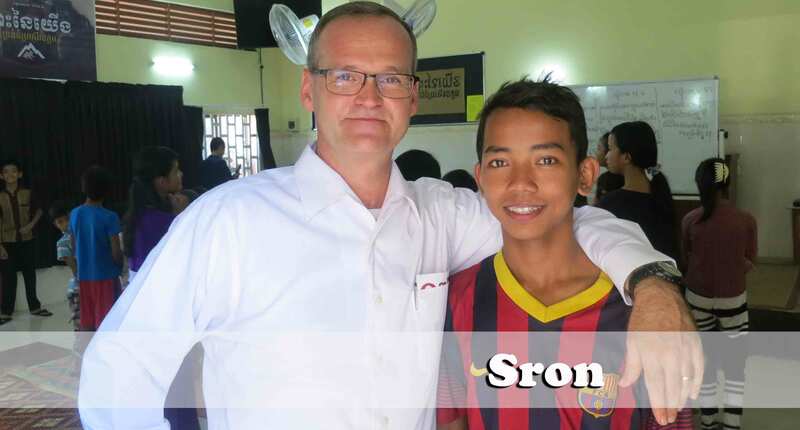 Sron was disowned by his family several weeks ago because he refused to renounce his faith in Christ. He has been living with one of the men in our church since the day his mother threw him out of the house. It has been a blessing to have him join our Saturday evening men’s accountability group and to see the changes that are taking place in his life. 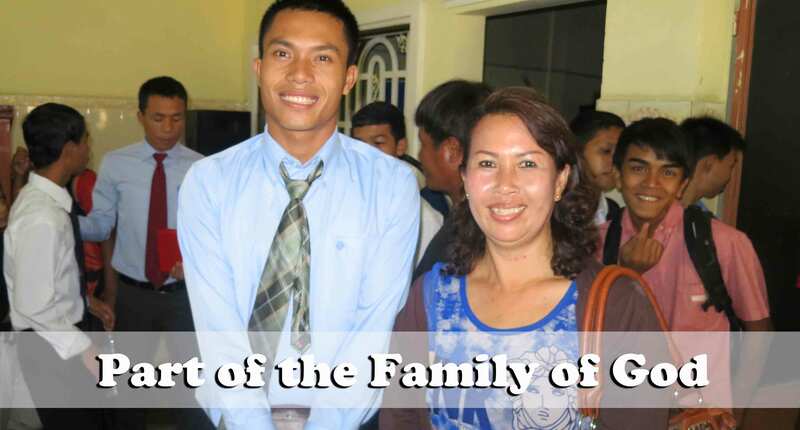 Please pray for God’s comfort to be real in Sron’s life and for him to continue to grow in his walk with the Lord. Also, pray that his family will come to Christ. 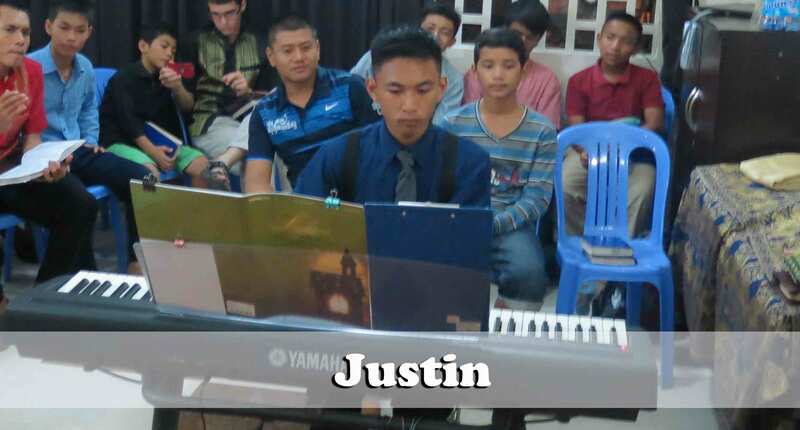 Justin Keo has only been taking piano lessons for just over a year but he is doing a fantastic job. God has given him a gift for music. Through his natural God-given ability as well as his faithfulness to practice he is quickly becoming an accomplished pianist. Sunday evening he played a special arrangement of “Tis So Sweet to Trust in Jesus.” We are blessed to see the growth that is taking place in his life. It was a blessing to be able to present new Bibles to these two young ladies Sunday evening. They are new believers and worked very hard to fill out the nearly 150 question booklet over the Gospel of Mark that we gave them in order to earn their Bible. We have probably 6-8 other folks who are currently working on earning a Bible as well. We are grateful for last year’s Senior class of Pacific Baptist Church of Long Beach for providing us with a stock of Bibles for new believers. For many of our people it would be virtually impossible for them to save the money it would take to purchase a Bible. We are blessed to see Srey Roueth and Ly Horn’s love for the Lord and the changes that have taken place in their lives since being saved. 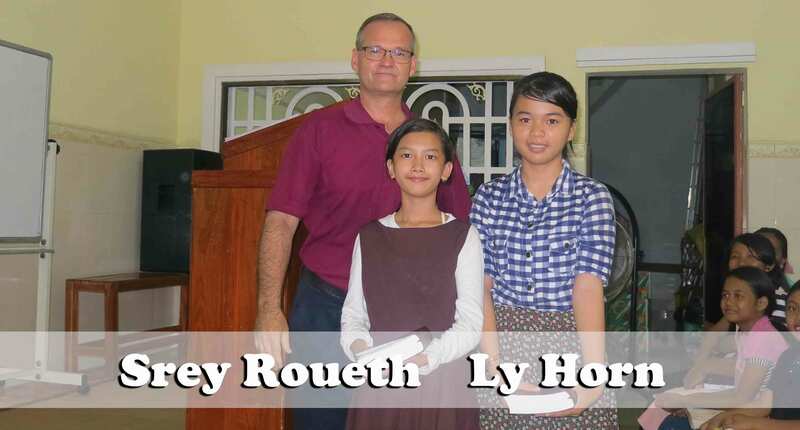 Both of these young teen girls were reached over the past several months through the Phnom Penh Children’s Ministry. 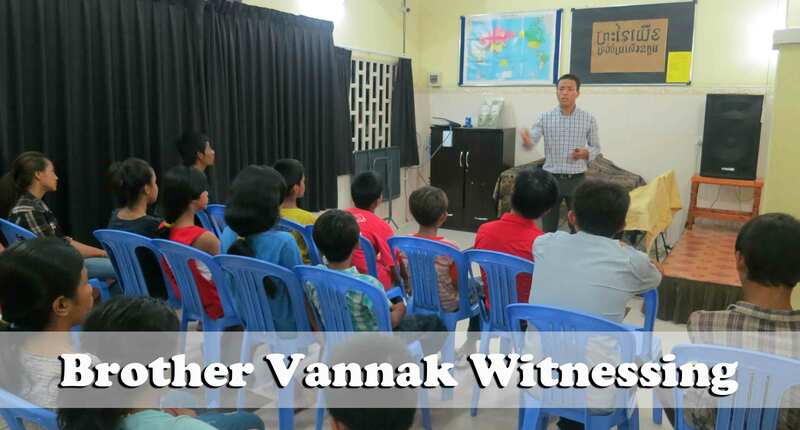 As we have mentioned in the past, the Phnom Penh Children’s Ministry as well as our children’s ministries scattered throughout several other locations, is now totally run by national believers. Many of the leaders in our children’s ministries are teenagers who have been reached through the Phnom Penh Children’s Ministry themselves. Nisa is 16 years old and is such a sweet and godly young lady. We are blessed to see her spirit of humility to serve wherever she is needed. Sok Chea is 19 years old and is the older sister of Nisa. She recently began teaching the younger children during the 11:00 a.m. hour every Sunday. This Sunday she taught on the story of Creation and did a splendid job. 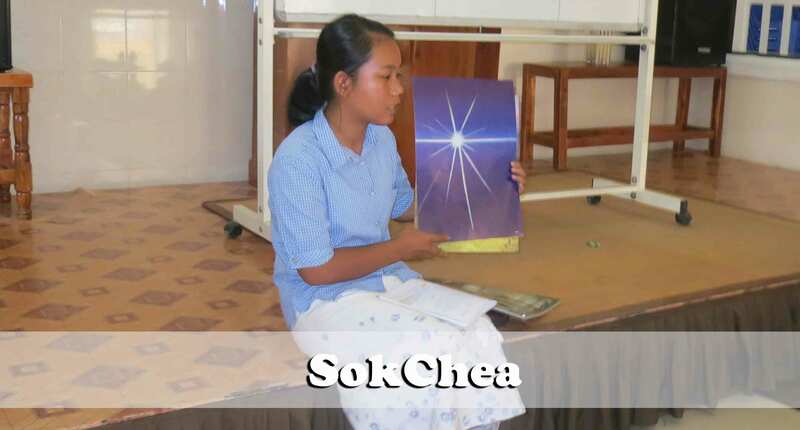 Sok Chea is presently a freshman in college and is studying Accounting. Here is a short video of one of the “tuk tuk” routes dropping off a few children at the church. Remember these children and the many other children who are taught God’s Word each week. The vast majority of the hundreds of children who study with us each week in various locations come from homes that are ambivalent at best, and hostile at worst toward the gospel. Each Sunday at 12:00 noon a group from the Phnom Penh church loads up and makes the long trip to Ta Skov village to teach folks about the Bible. Taiwan, the man standing on the left side of this picture, is leading the group in prayer before they take off. Taiwan was originally from Ta Skov village and has a burden to see his fellow villagers come to Christ. “Fake churches” (I will explain that some other time…) and unscrupulous Christian workers from various denominations have virtually ruined the name of Christ in this village. The giving away of money, food, medicine, and education by these groups in exchange for “getting saved” has made it substantially more difficult than usual to earn a hearing in this village. Please continue to pray for Brother Taiwan and his workers as they strive to faithfully serve in Ta Skov village. Taiwan works as a private chef for a wealthy business man and volunteers his afternoons every Sunday to serve the Lord. Thank God for his example! 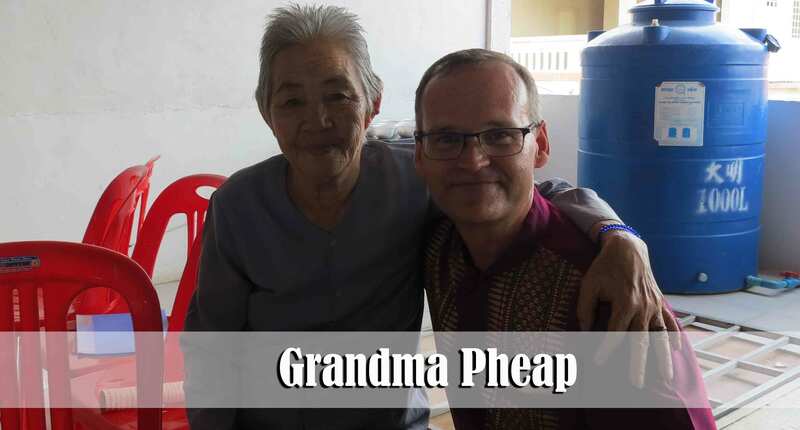 It was a blessing to have Grandma Pheap in the service on Sunday morning. She speaks Khmer fluently but is only able to read Vietnamese. The Vietnamese Bibles are written in a font so small that basically anyone over the age of 40 would have difficulty reading it, especially here in the third-world. We are working on preparing the Books of John, Romans, and 1-3 John for her in a font large enough for her to read. Over time we hope to add other Books of the Bible to the collection. It takes a long time to prepare something like that but she is hungry to grow as a Christian and loves to read so it is worth the time invested. It was a blessing to have Ou share a testimony in our Sunday evening service in Phnom Penh of how he was able to lead his 94 year old grandmother to Christ this past week. Thank God for his faithful witness to her over the past several months. 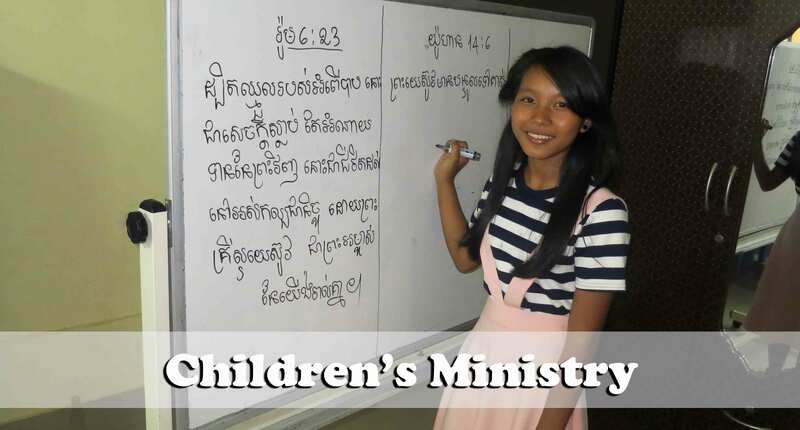 Both Ou and Seyha were reached through the Phnom Penh Children’s Ministry. Seyha just recently told one of our leaders that he knows that any day now his mother is going to kick him out of the house because of her disdain for Christianity. She has warned him several times already but has not yet carried through with her threats. Pray for Seyha to have wisdom and boldness to be faithful to what he knows to be true no matter what the consequences. Monday evening Brother Vannak and his workers hosted a small fellowship for some of the young people on their “tuk tuk” route. He invited only those who have been attending for a while but who are not yet saved. The purpose of the fellowship was to demonstrate the love of Christ toward them as well as have an opportunity to once again present the plan of salvation to them and seek to persuade them to be saved. (2 Corinthians 5:11) We are so blessed by Vannak and Samantha’s testimony and their zeal for the things of the Lord. Please continue to pray that Vannak will be faithful to the Lord and that God will continue to provide for their needs. I have included a short video clip of his teaching time and translated it into English. You can click on the video below to hear him teaching on Revelation 20:15. When you write I know God Is answering my prayers. Each picture and article bring me peace and joy. 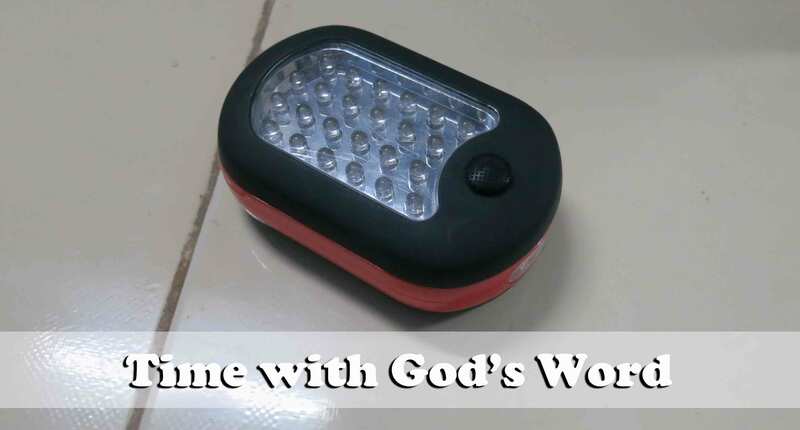 The hymn says, “How beautiful to walk in the steps of the Savior, stepping in the light, stepping in the light: How beautiful to walk in the steps of the Savior, Led in paths of light.” The Holy Spirit in me rejoices with all your articles and prayers are given where you ask for them. We in the l USA are also influenced by the world, Satan’s work is so prominent and is felt. We have seen families joining our church, but then they are not faithful to come. I pray we could have overflow like your church. This weekend we are having our old fashioned camp meeting. We used to have a great crowd…after several years of no camp meetings it will be good renew old friendships and new ones. I pray for decisions to be made and souls to be saved and renewal of dedication to God’s principles. Awesome-appreciate the update! Thanks for the teams’ example and for being a “conscience”; that we too can be more fervent in our service to Him here. It is very sobering as well as uplifting to read your updates and realize the need and the power of the gospel of Jesus Christ. May God’s armour surround you and those with whom you work. Prayed for you, your family and the team this morning. Thanks for all you do and thank you for your example to my family. We love you! As always, great update! Exciting to hear of all that is going on, even just in the past couple of weeks. Thank you for the update! – Especially the salvation story of Heng! Helps keep things in perspective. Thankful to see right Scripture applied to these situations!